294 pages | 3 B/W Illus. Language is perhaps the most common issue that surfaces in debates over school reform, and plays a vital role in virtually everything we are involved. This edited volume explores linguistic apartheid, or the disappearance of certain languages through cultural genocide by dominant European colonizers and American neoconservative groups. These groups have historically imposed hegemonic languages, such as English and French, on colonized people at the expense of the native languages of the latter. 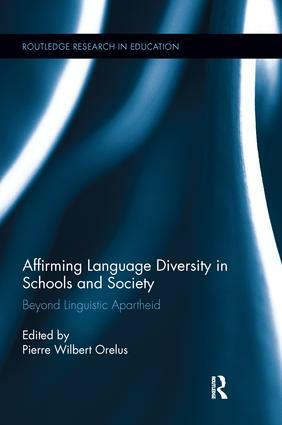 The book traces this form of apartheid from the colonial era to the English-only movement in the United States, and proposes alternative ways to counter linguistic apartheid that minority groups and students have faced in schools and society at large. Contributors to this volume provide a historical overview of the way many languages labeled as inferior, minority, or simply savage have been attacked and pushed to the margins, discriminating against and attempting to silence the voice of those who spoke and continue to speak these languages. Further, they demonstrate the way and the extent to which such actions have affected the cultural life, learning process, identity, and the subjective and material conditions of linguistically and historically marginalized groups, including students. Pierre W. Orelus is assistant professor at New Mexico State University. His research interests include language, race, and gender studies; post-colonial, transnational, and immigrant studies; and critical pedagogy. His recent books include Whitecentricism and Linguoracism Exposed, The Race Talk, and Radical Voices for Democratic Schooling with Curry Malott.